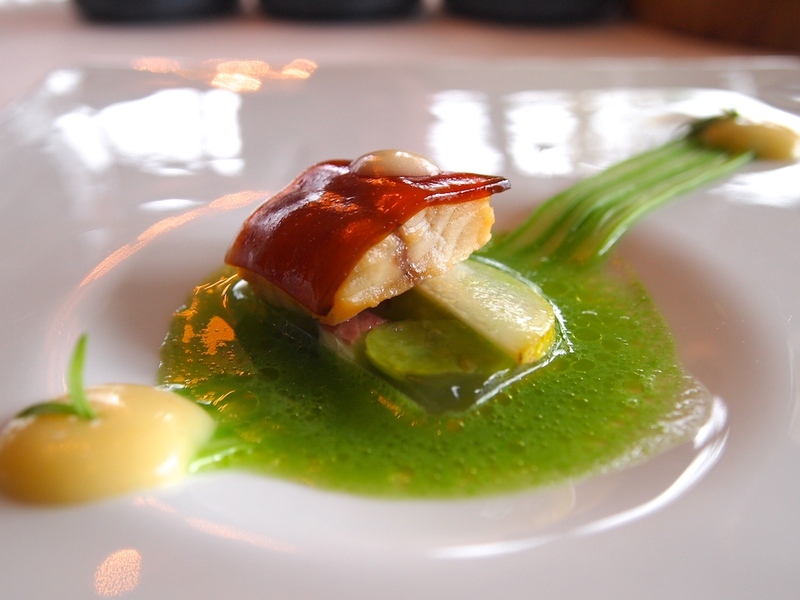 Just last December, it was announced that Burg Schwarzenstein, a luxury hotel located in the Rheingau wine region in Germany, had brought chef Nils Henkel on board to run their gourmet restaurant. Nils Henkel used to be executive chef at Gourmetrestaurant Lerbach at the Schloss Lerbach hotel in Bergisch-Gladbach, but he kind of fell of my radar when Schloss Lerbach ("Lerbach") closed its doors in December 2014. Henkel is a well-known and highly respected chef in Germany. For years he was the right-hand man of chef Dieter Müller at his eponymous three-star restaurant at Lerbach, at the time a highly sought-after destination restaurant. He joined Dieter Müller's kitchen team as sous-chef in 1997, the same year the restaurant was awarded its third Michelin star. In 2004 Henkel was appointed head chef, becoming executive chef in 2008. Two years later Dieter Müller left Lerbach, but Nils Henkel managed to retain Lerbach's three Michelin stars. 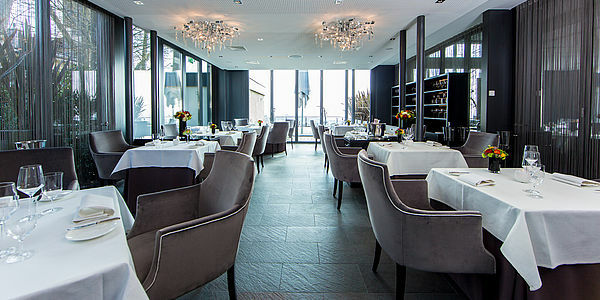 In 2012 however, Michelin Germany demoted the restaurant to two stars. Henkel's new home Burg Schwarzenstein ("Schwarzenstein") is nestled on top of a hill above the village of Geisenheim, offering quite specatucalar views of the Rheingau valley. The hotel houses three restaurants, the aforementioned gourmet restaurant (now called "Restaurant Schwarzenstein - Nils Henkel"), featured in the 2017 Germany guide with one Michelin star, the more casual "Burgrestaurant" offering a traditional menu, and there's a grill & wine bar. The hotel is owned by Ernst Udo and Ursula Grossmann, who acquired the property in 2004. Lunch started with a selection of four appetisers. 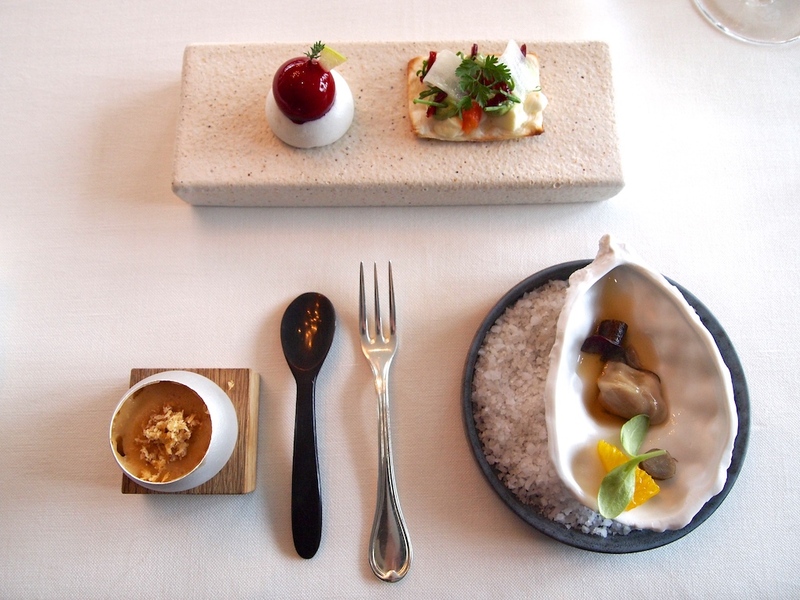 Served in a ceramic oyster shell was a Gillardeau oyster with ponzu, orange, and marinated burdock root. Also there was mini Flammkuchen topped with rocket crème, lightly melted cow's milk cheese from Salzburg, onion, and little pieces of skinned tomatoes. A wonderful little bite with refined flavours, but still delivering a true Flammkuchen flavour/texture experience. 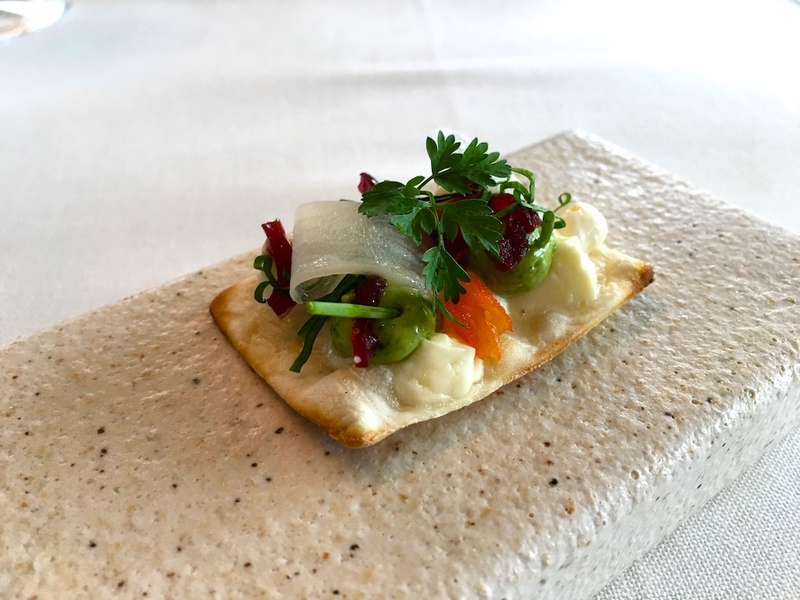 Equally wonderful was a bite based on the Frankfurt speciality "Handkäse", a marinated cow's milk cheese traditionally served with "Musik", a mixture of raw onions and cumin or caraway seeds. 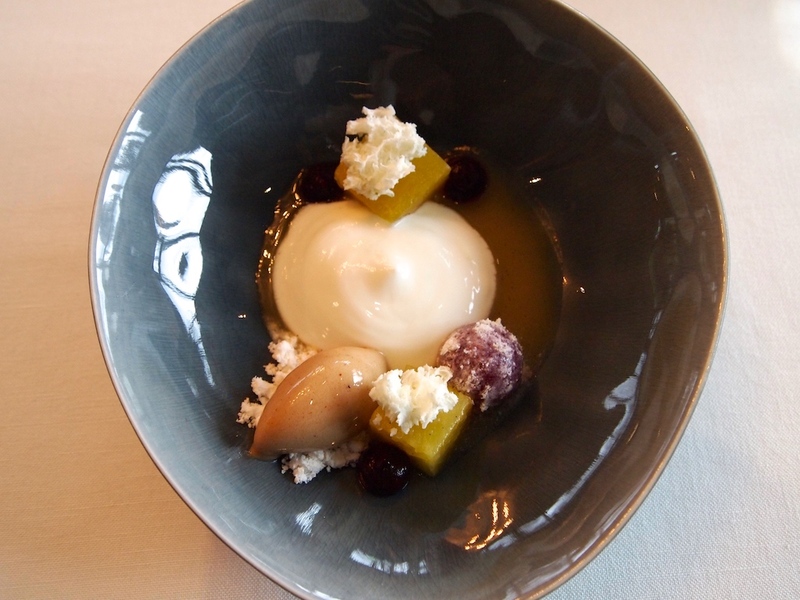 Here the cumin was incorporated in a meringue base, topped with a Handkäse bonbon coated with cherry jelly. A delicious combination, the cumin delivering a nice, nutty finish. Finally there was a "surprise egg" with a rich beef stew at the bottom, followed by a soft egg yolk and some mushroom crème. A lovely and original combination of hearty flavours. Next we were served an amuse bouche inspired by the traditional German "Aal und Bohnen" (eel and beans) combination. A piece of fatty and moist smoked eel was covered with eel jelly, and served with broad beans and eel in aspic, sliced pear, a sweet pear emulsion, runner beans seasoned with a hint of savory (Bohnenkraut in German), and green bean juices. A terrific dish, the grassy sweetness of the beans matching the rich eel wonderfully, and the bean juices brought a lovely freshness to this dish. Nice and subtle use of savory too, a herb that has such a natural affinity with beans. 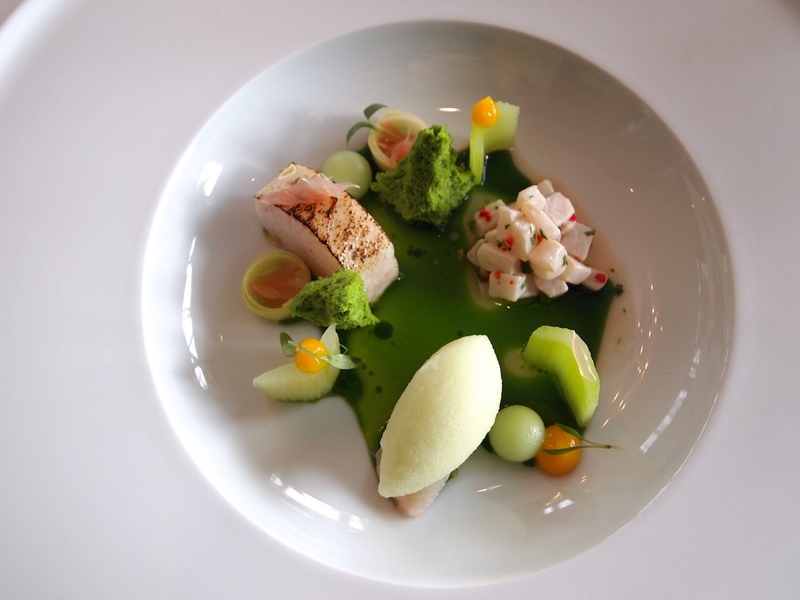 First course of the tasting menu was ceviche of kingfish and charred kingfish, served with celery sorbet, fresh celery, coriander sponge cake, fresh pomelo fruit, a few dots of orange puree, semi-liquid celery and buttermilk spheres, and a sharp citrus-chervil-celery juice. Two excellent preparations of kingfish: the acidity in the ceviche had gently cooked the firm fish, softening its texture a bit, and the charred fish was firm but succulent and had nice clean flavours. All the other flavours were well-defined, particularly the celery sorbet, which tasted pure and intense, and I really liked the crunchy off-raw pieces of celery. However, even though this dish certainly delivered on flavour and texture, it did find the level of acidity on the high side. At least for my palate, but it certainly woke up the taste buds. 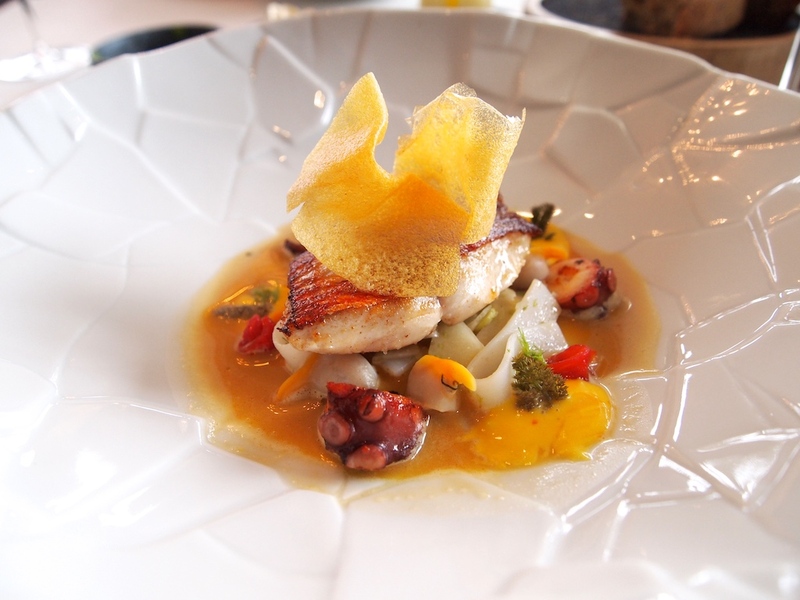 Second course was redfish surrounded by three dabs of rouille, and accompanied by clams, ribbons of squid, grilled octopus, fennel, strips of red pepper and chopped confit tomato. 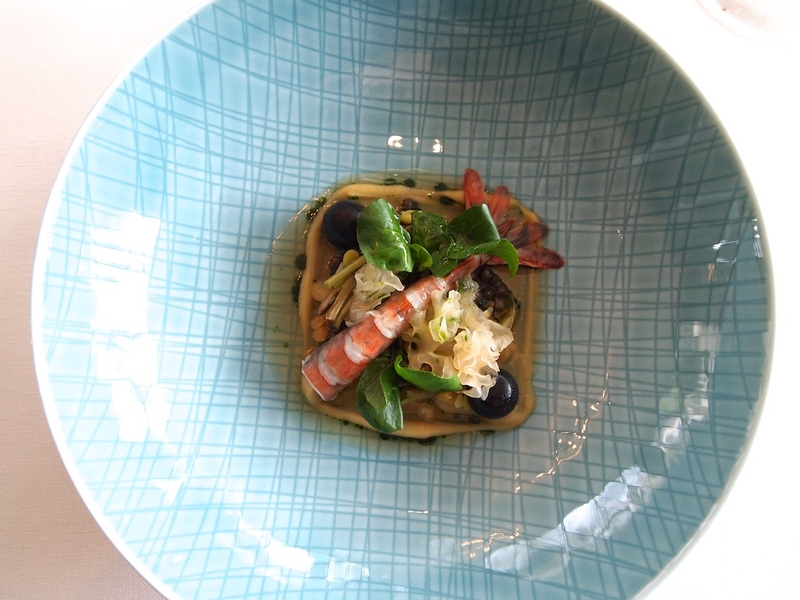 Finally an absolutely exquisite sauce bourride was poured around this seafood feast. Expertly cooked redfish, with beautiful caramelisation on the skin, perfectly moist flesh, and with a nice rich flavour. The combination with the other ingredients worked brilliantly, in particular the crunchy fennel, which provided balance, and its aniseed flavours highlighting the sweetness of the seafood, but also the red pepper, its bittersweet flavours giving the dish body and character. Turning up the volume was the saffron rouille, which delivered a touch of piquancy and added an attractive unctuousness. A spectacular dish with big flavours, but delivered in the most refined fashion. On to the third course, a carefully constructed dish of Bavarian shrimp served with a miso crème, watercress, marinated cress stalks, watercress broth, soy sauce spheres, lentils and cauliflower mushrooms. Wonderfully sweet, off-raw shrimp, farmed (aquaculture) in Erding (some 26 miles from Munich) marrying well with the mineral freshness of the watercress and the earthiness of the lentils, and the miso being a lovely flavour booster. The soy sauce spheres didn't have a liquid or semi-liquid filling. I'm not sure whether this was intentional or unintentional. All the same it was a pleasing dish that delivered on flavour and had lovely contrasting textures. 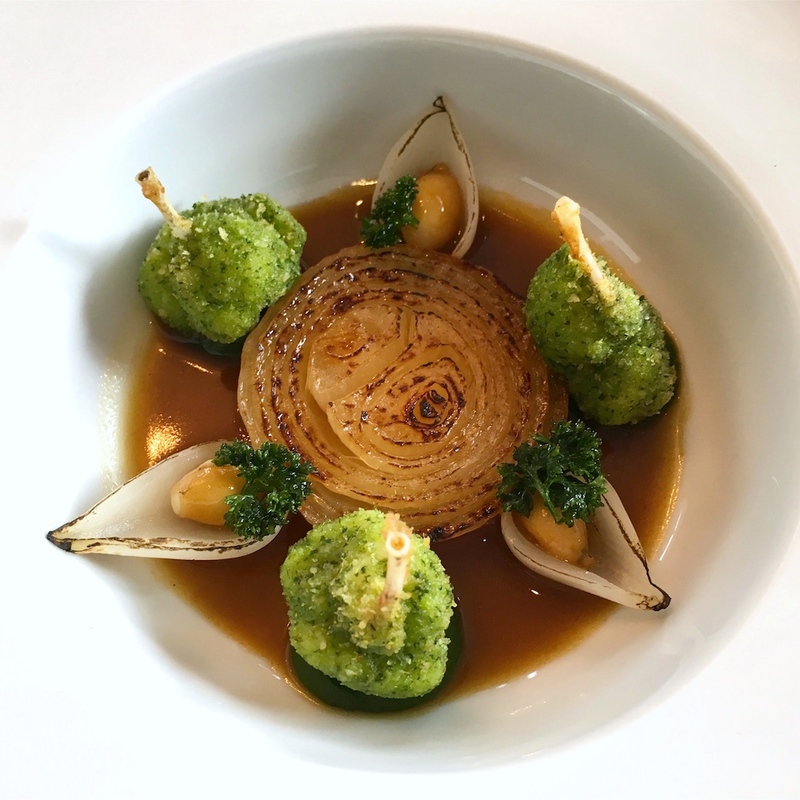 Next up were frog's legs with a delicate, crisp coating of parsley crumbs and succulent meat, placed on top of some parsley puree, and superbly paired with a deliciously soft roasted onion, charred onion petals filled with onion puree, and a beautifully flavoured liquorice root sauce. A lush and exuberant dish with wonderfully rich flavours, balanced out perfectly by the parsley puree, and the subtle but distinct liquorice root flavours gave the dish an interesting finish. The tasting menu would have continued with two more meat courses, veal tongue and lamb, but I had requested to change these into two vegetarian courses. 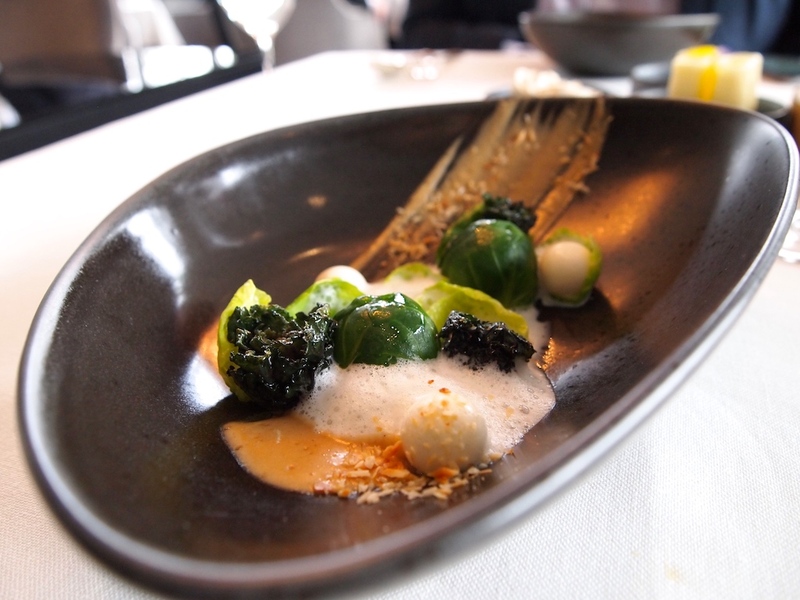 First up were Brussels sprout leaves with a gorgeous filling of chopped braised Brussels sprouts, a buttery hazelnut crème and finely chopped hazelnut, and accompanied by soft, smoked Brillat Savarin balls, kale sprouts and hazelnut infused milk foam. It's rare to see a great, well-constructed dish entirely based on the unglamorous Brussels sprout. Here they were handled with skill and care; the combination with the hazelnut gave the sprouts an optimal taste and the addition of the smoked cheese provided a nice extra flavour dimension. This was followed by a main course of various preparations of root vegetables, such as a smooth orange swede puree, beetroot, including a jellied bonbon with a soft beetroot filling, carrot, and accompanied by pickled onions filled with "Wachtelsoleier" (preserved quail's eggs), trumpet mushrooms, cep powder, and the dish was finished with a light caraway-flavoured broth. 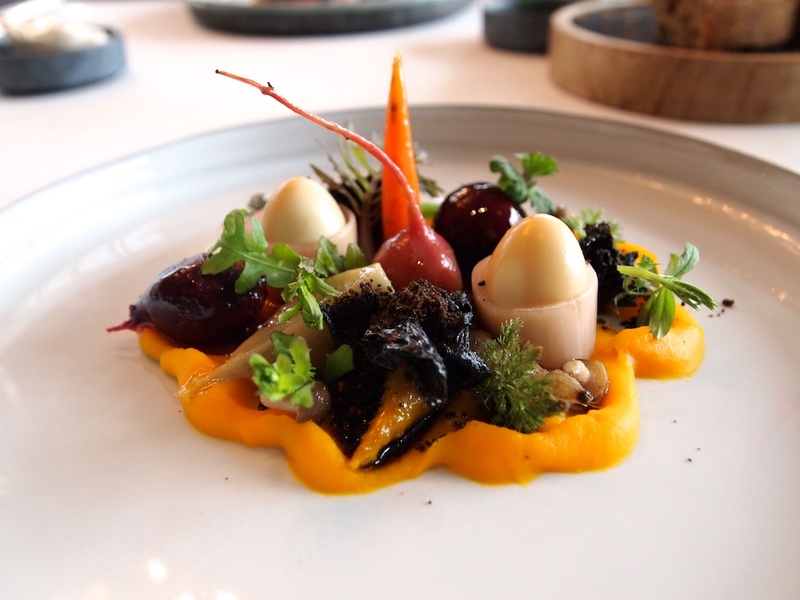 A colourful dish with a lovely series of textures, but more importantly a creative and original use of root vegetables, the sharpness of the onion and eggs making for a good contrast to the elegantly sweet and nutty flavours of the carrot and swede. Well-judged use of the Wachtelsoleier too; a soft-boiled, runny quail's egg would have unbalanced the dish. The meal ended with two desserts. First to arrive was a combination of light and airy yoghurt cream, a sweet and tangy tamarillo sorbet, some juicy and spicy caramelised pineapple, a sweet and sour pineapple and tamarind puree, and a slightly thickened spiced pineapple sauce. An attractive dessert with lovely contrasting flavours, the sweet against the spicy/tangy, the yoghurt cream delivering just the right touch of freshness, and the tamarind adding some pleasing complexity. A dessert of rhubarb, cheesecake and "Butterkeks" followed. Butterkeks are classic German butter biscuits sold under the brand name Leibniz Butterkeks by the Bahlsen food company in Hannover. Here the biscuits were made into a buttery Butterkeks crème and there also was some whipped Butterkeks cream seasoned with lime and coated with finely ground Butterkeks crumbs, the latter served on top of some rhubarb compote. 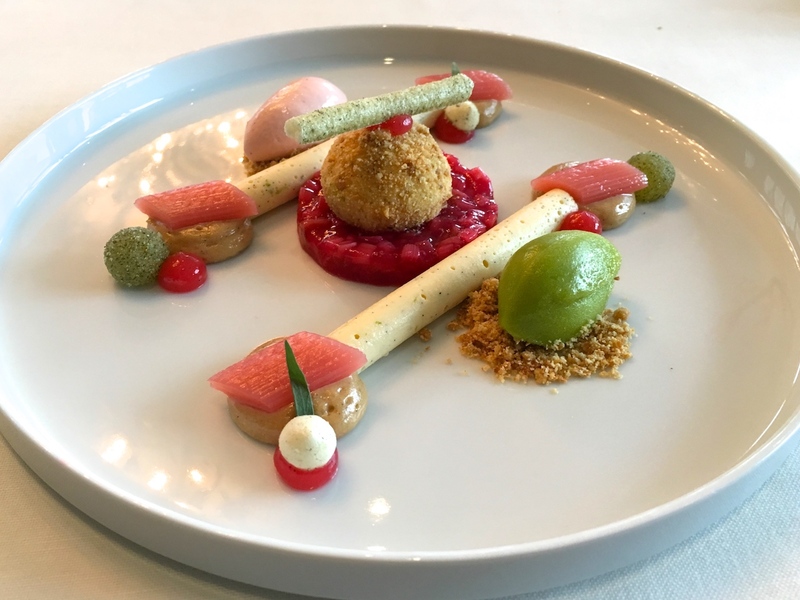 Also on the plate were "strings" of cheesecake, rhubarb ice cream, rhubarb gel, tarragon sorbet, a few pieces of tender and succulent poached rhubarb, and some sweet mini tarragon meringues. A well-constructed dessert with a pleasing balance between richness, sourness, and sweetness. The tanginess of the rhubarb balanced the rich cheese cake and Butterkeks crème nicely and the flavour pairing of rhubarb with tarragon worked wonderfully well. Caramac 2017, one of the treats served with our coffees. 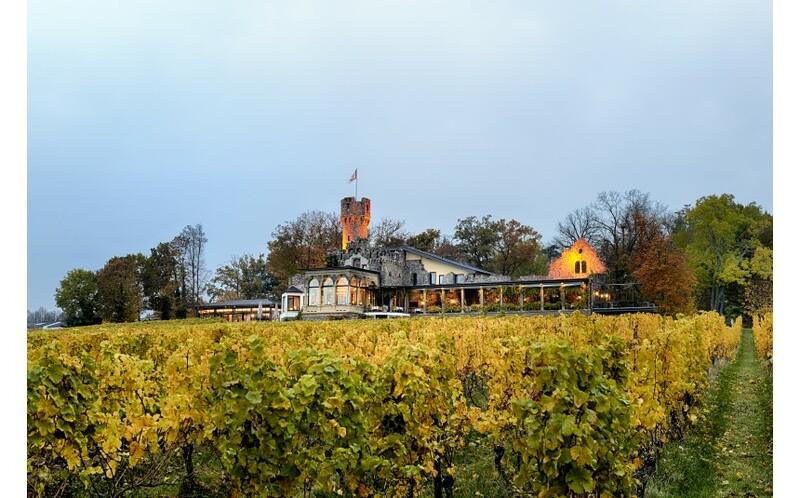 Ever since they acquired Burg Schwarzenstein, the owners, but also managing director Michael Teigelkamp, have been very open about their ambition to turn Schwarzenstein into the Rheingau's "erste Adresse" (first choice). With the hotel they've already reached this status, but with signing Nils Henkel, who's one hell of a chef, they will able to push the restaurant to the upper echelons of German gastronomy. 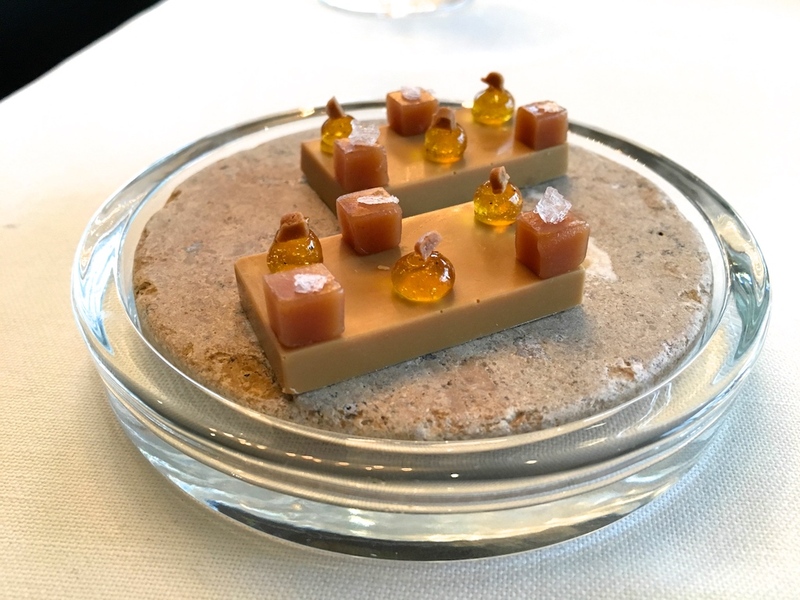 The Rheingau hasn't had a two-star restaurant since Joachim Wissler was cooking at restaurant Marcobrunn in Eltville in the late 90s, but I believe that's about to change. Nils Henkel is a culinary renaissance man who (still) masterfully blends classic with modern. This was perhaps best embodied in the brilliant frog's legs and onion dish but the Brussels sprout dish is also a fine example. Today's dishes were technically strong with creative and balanced flavours, a focus on seasonal ingredients, and all cooked with great attention to detail. When I visited, Henkel had been in charge of the kitchen for a little over six weeks only, but he was already at full speed and had put together an 8-course menu that could easily be served in one of Germany's finest two-star restaurants. The hefty €180 price tag of the menu also indicates that this is (at least) the level they are aiming for. That said, I did feel that he still needs to dot some i's and cross some t's, before his cooking will be at the same level as I experienced in 2013 at Lerbach. But for now, as they say at Oxford University: passed with minor corrections.